Jeremy enjoys gaming when not working as a chemist and business manager. It seems no collectible card game can resist the allure of including ever-beloved dragons: Pokemon has 'em, Yu-Gi-Oh loves them, and Magic: The Gathering of course follows suit. Yet out of Magic's thousands of cards, only a few dozen belong to this rare type, helping them feel majestic and fierce. Most need a fair chunk of mana, but bear flying and impressive combat stats. So, which mythical beasts are worth casting? 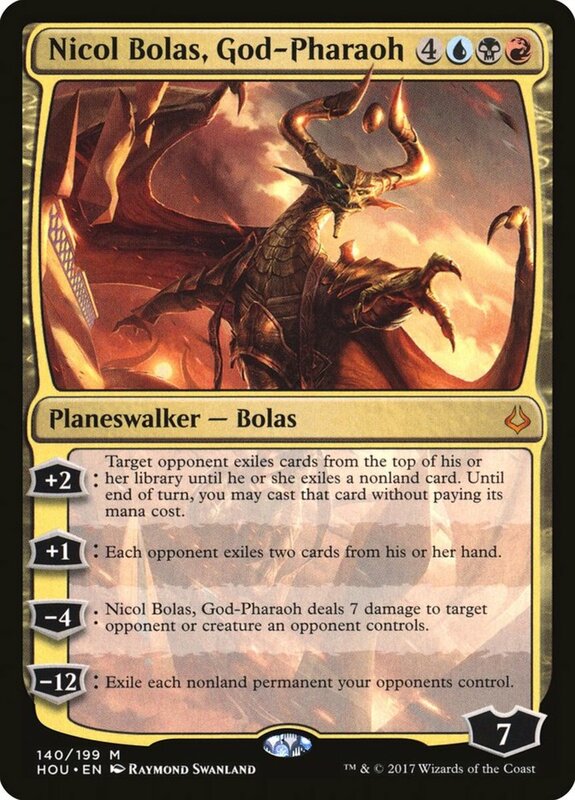 These are the top ten dragon spells in Magic: The Gathering! 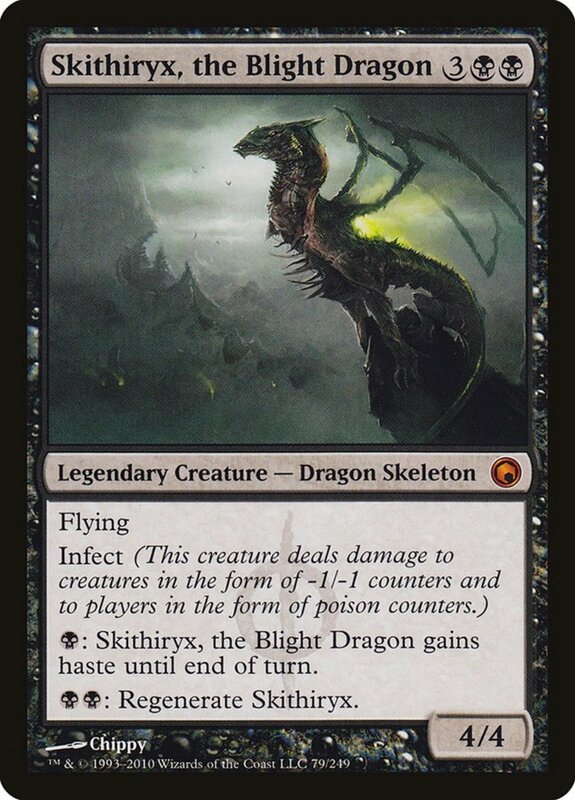 The infect trait means Skithiryx can instantly-win with just a few attacks, especially since it can give itself haste, and it can even revive itself if slain. 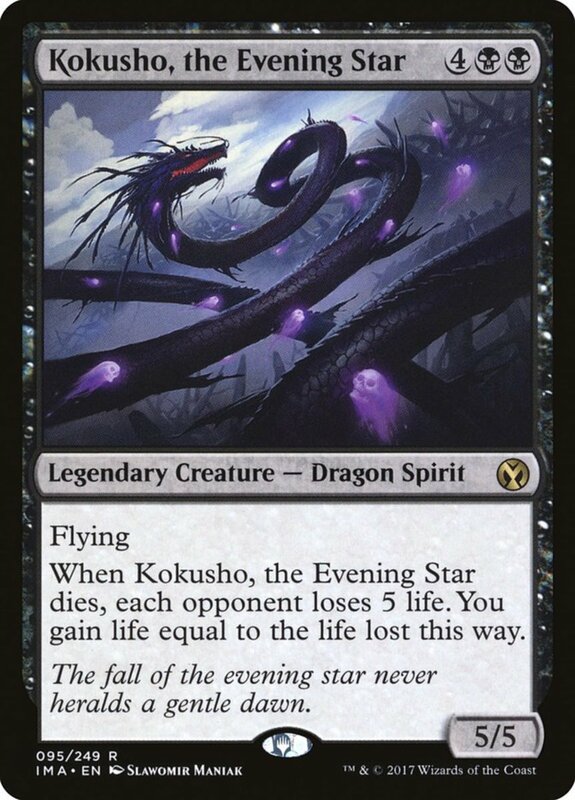 Additionally, infect works great at removing indestructible creatures, who still perish if their toughness hits zero, further justifying this ebon legend. Silumgar enters as a 3/5; although its power may seem comparatively low, deathtouch automatically kills anything it fights, eliminating the problem. 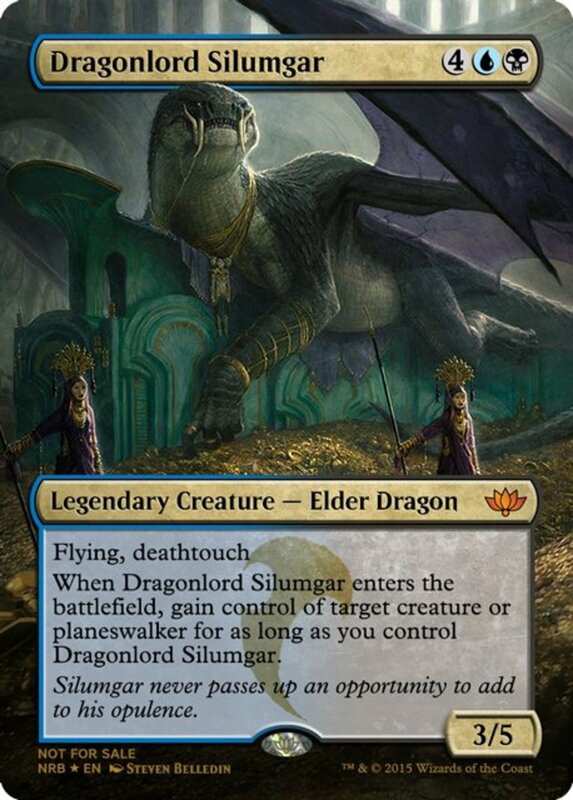 Even better, Silumgar lets you steal an opposing creature or planeswalker for as long as you control Silumgar! This is a fantastic trait that both removes an opposing force and gives its power to you. Prepare some hexproof or shroud-bestowing artifacts to ensure Silumgar sticks around long enough to employ your captured minion. 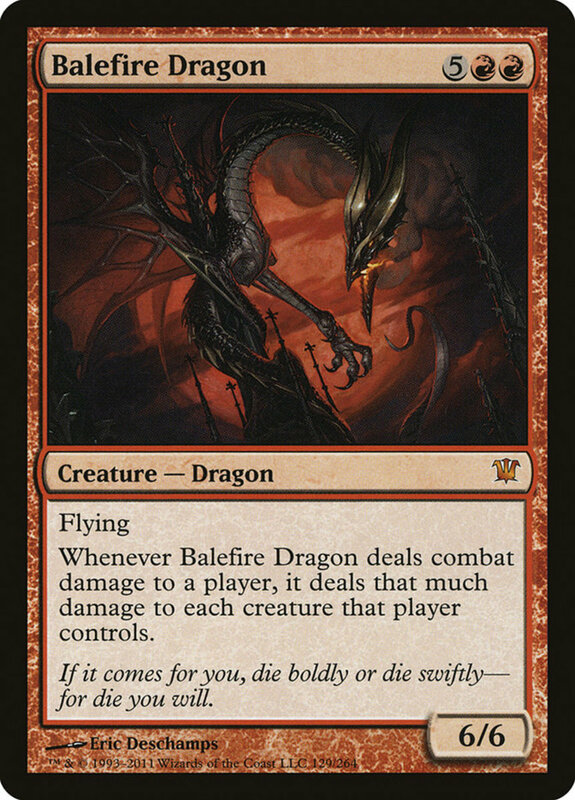 One of red's several impressive behemoths, Balefire joins the fray with the usual high battle attributes and flying trait typical of dragons. It also possesses an ability that reflects combat damages it deals to your opponent onto all their creatures! 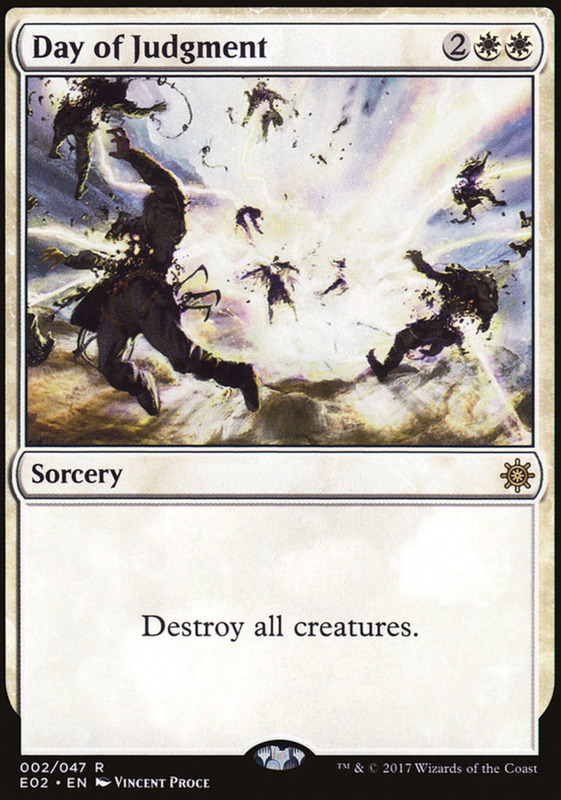 Thus, if your opponent has no flying blockers, or if you make Balefire unblockable with certain equipment, it can easily exterminate your opponent's entire army when it damages them directly. 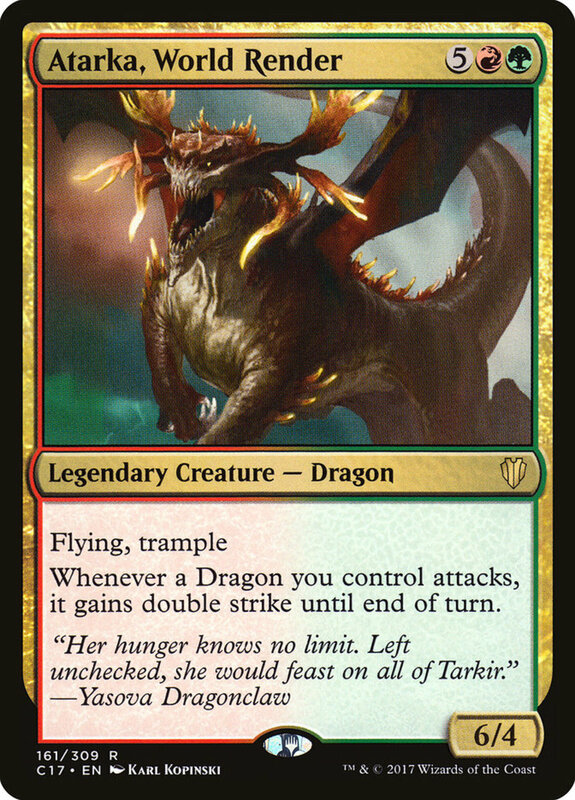 Double strike is one of the best traits in the entire game, essentially letting a creature attack twice with every blow; Atarka not only gives it to itself, but all your winged reptiles whenever they strike. Add in Atarka's trample effect, and your opponent will soon perish against your double damage, creature-piercing allies. A 5/5, Scourge here represents one of the best comeback cards in the game. 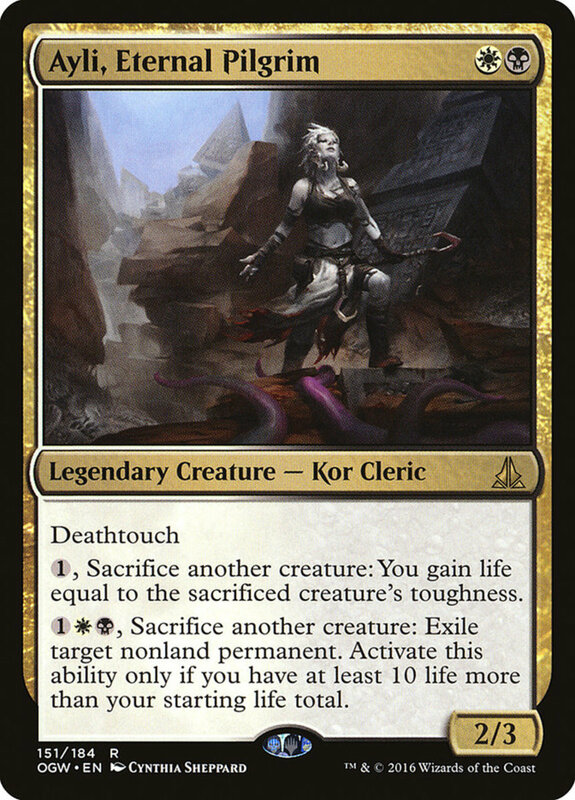 With its dethrone attribute, whenever it attacks the player with the most life, Scourge gains a permanent +1/+1 counter. In addition, you get to untap all your creatures and have a second battle phase for the turn! Scourge's abilities fortify itself while enabling numerous attacks on your adversary; make sure to save it for situations where their life exceeds yours. 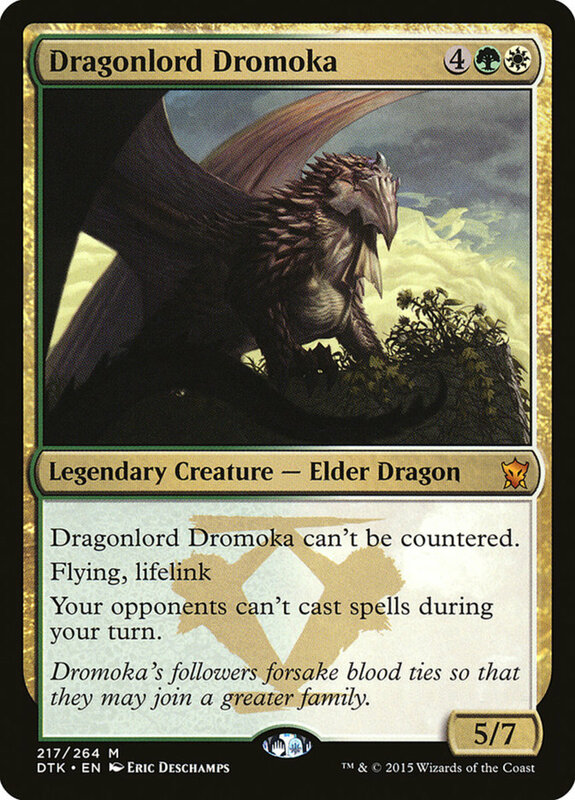 Dromoka offers a great option for white and green, especially useful considering their relative lack of notable dragons. For only five mana, you get a five power and five toughness creature with the usual flying ability. Even better, Dromoka bolsters two whenever a dragon of yours attacks, meaning your creature with the lowest toughness gets two +1/+1 counters! Simply have Dromoka and your other dragons strike to drastically boost your weakest monsters and ensure every member of your team is battle-ready. As a bonus, Dromoka is one of the cheapest dragons here, and you can often snag him for under a dollar! 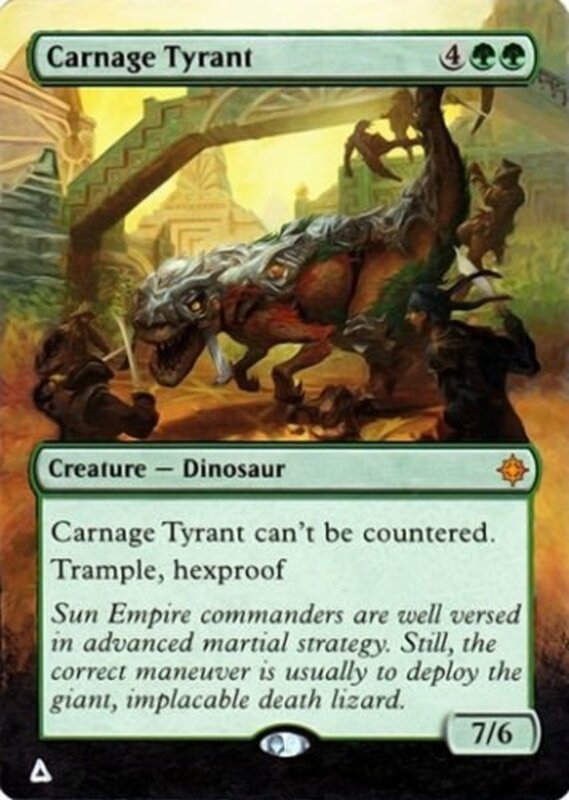 Another five-cost reptile, Ojutai arrives with a respectable 5/4, flying, and two alluring abilities. First, he has hexproof as long as he's untapped, making your opponent unable to target him. Second, whenever he deals combat damage to a player, you get to look at the top three cards of your deck, add one to your hand, and put the rest on the bottom. 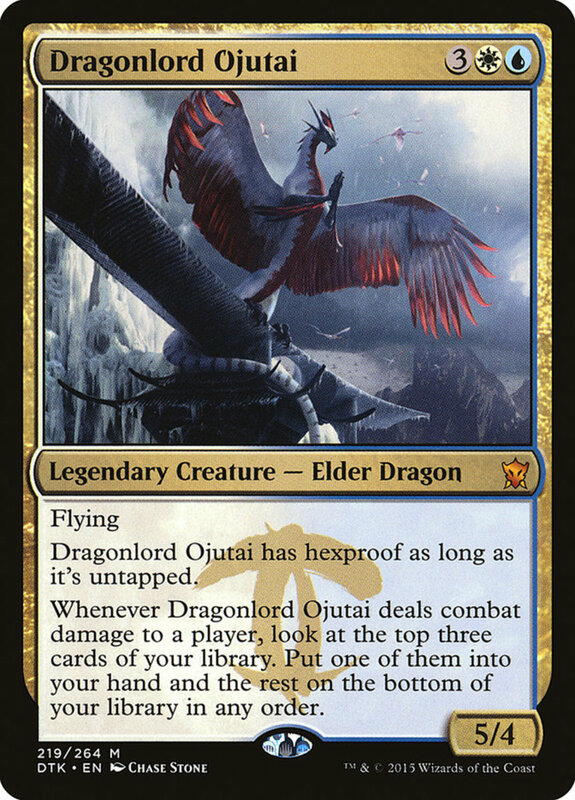 Ojutai's great draw effect, unique color combination, and unreliance on other dragons earns him a spot in many builds. 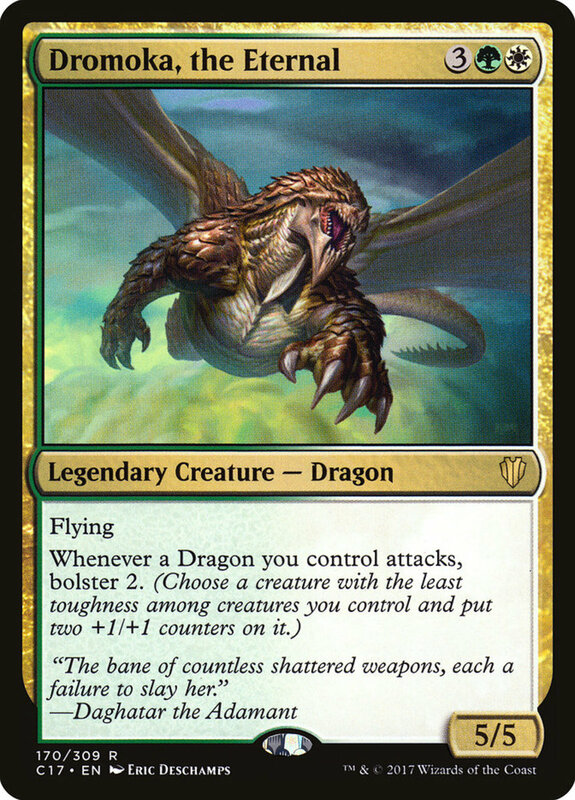 Another green and white dragon, Dromoka demands six mana but arrives brandishing an impressive 5/7. He also has flying, cannot be countered, and prevents opponents from casting spells during your turn. This means that as long as you can keep Dromoka alive, you're essentially immune to having your cards be countered, a great defense against a primary strategy of blue. 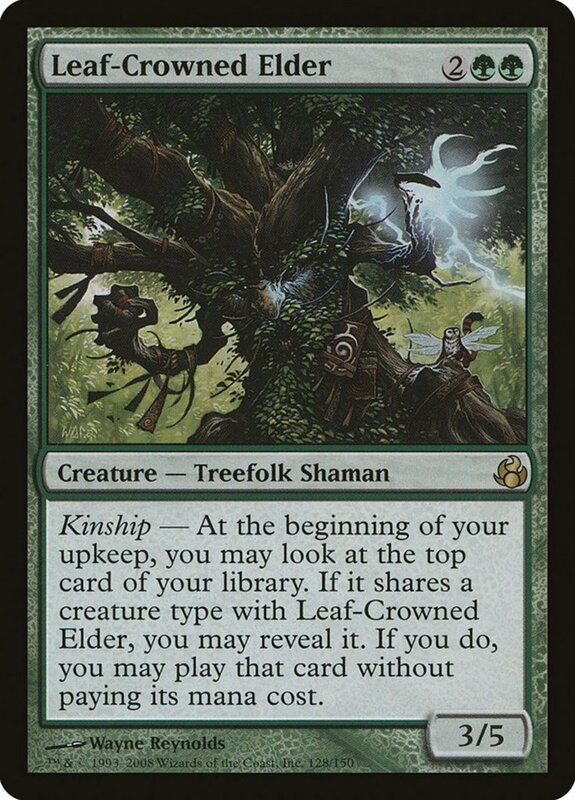 This also helps avoid instants from other colors as well, letting you relax during your turn. 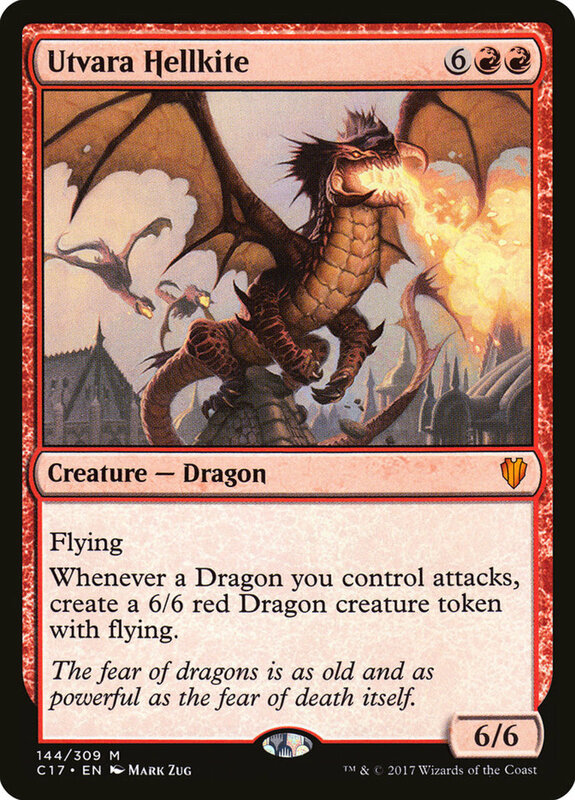 Yet another tremendous red dragon, Utvara boasts of its 6/6 while activating an amazing, self-stacking ability: Whenever a dragon you control attacks, place a 6/6 red dragon token with flying onto the field. Basically, whenever any of your dragons attack (including tokens), you gain a new minion with Utvara's strength. If your opponent can't deal with Utvara soon after its arrival, they'll soon be crushed under the weight of an ever-multiplying swarm of powerful dragons. Tyrant's mighty stats plus flying and trample already impress, and its ability to steal artifacts really cements it as our best dragon yet. This lets you pilfer and command commonly-used artifacts like Sol Ring, Worn Powerstone, Paradox Engine, and also earns you the win simply by owning enough of them. Finally, unlike Silumgar, you get to retain control of the treasures even if Tyrant dies; once they're yours, they're yours. 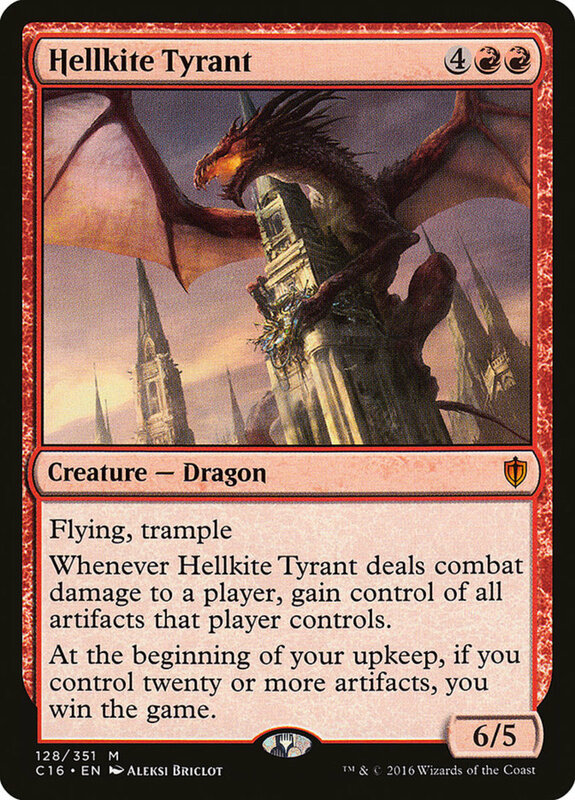 Thankfully, despite his fierce powers, you can obtain your own Hellkite Tyrant for less than six dollars! Which dragon do you prefer? 907 people have voted in this poll. Magic's resource-gathering system helps dragons feel authentic. They're not the most abundant cards, and they demand a fair chunk of mana to use, but your winged reptiles leave a remarkable impression whenever they hit the field. To help supplement your dragons, use powerful supports like "Dragon Tempest" and "Sarkhan Unbroken" to empower your clan. 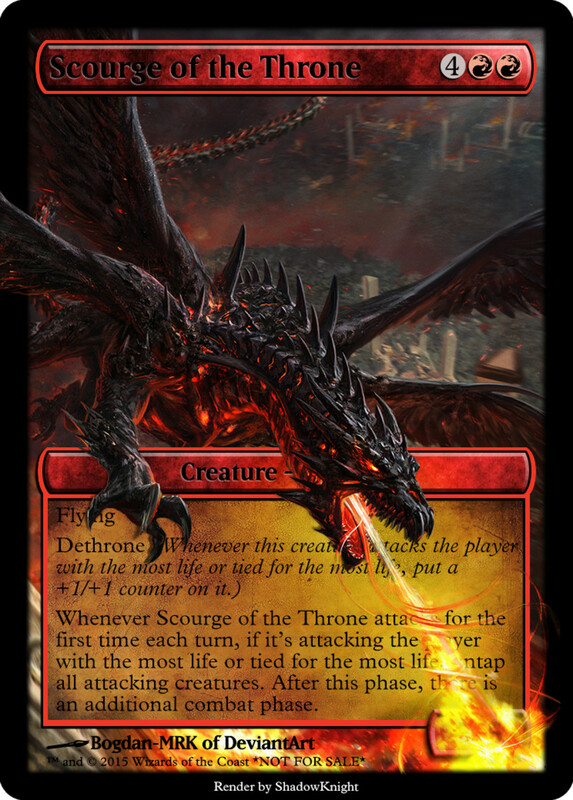 But for now, as we eagerly await Wizards of the Coast's future expansions of fire-breathing tyrants, vote for your favorite entry and I'll see you at our next MTG card countdown! Feel like I got a pretty good deck combining Ultvara, Savage Vietmaw, and Hellkite Charger. Savage gives you 6 mana during its attack and Hellkite lets you have another attack phase for 7 mana(now 1 because of the 6 you have), then Ultvara generates 3 dragons per phase. Add Dragon tempest and those tokens have haste and you double your dragons each phase. A few years ago I made a dragon-burn deck. It was a fun combo and I used a Hellkite Tyrant. Fun stuff.